Thank goodness things were back on track this week. You have been feeling so much better and most important are fever free. In less than two years time, you have given us way too many scares. You are such an adventure seeker and love to try anything and everything your big brother does. This week you helped me to "walk" and "kick" lots with Leslie Sansone. Of course, you were silly and wanted to take the DVD case with us when we went out. I think you have a little mini-crush on Leslie. Thursday we spent the afternoon the morning with Nana. You had a great time really exploring Chuck E Cheese with almost nobody else there. Then that afternoon you and NHL made Mimi and Aunt T smile. 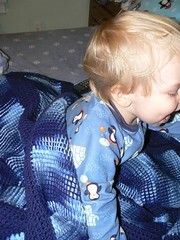 You hugged everyone and later at night modeled your new blanket that Aunt T made for you. It it hard to believe that in just over a month, my baby is going to be two. Time has gone by too quickly. Stay sweet my little one. Chuck E Cheese is the most fun with very few people there! They do grow up too fast. It seems like you blink and a year has gone by. Thanks for your comment. It was such fun to meet Tina! Who knows? Maybe life will bring us close enough to meet one day as well!